Drinking coffee is a whole ceremony in Ethiopia. It is an opportunity to discuss everything with each other and to keep in touch. 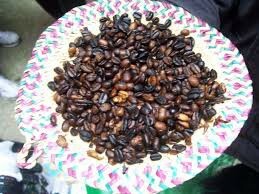 Ethiopian coffee is made by first roasting the fresh coffee beans in a pan and then grind them. Then, the coffee with water is put in a special coffee pot on the fire and cooked in seven to ten minutes. The coffee pot is placed a bit obliquely, so that the grounds drop to the bottom. Ethiopian coffee is served in small cups. 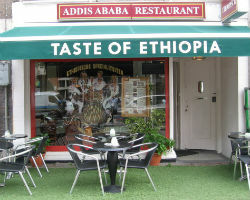 In terms of taste and strength, Ethiopian coffee resembles espresso very much. 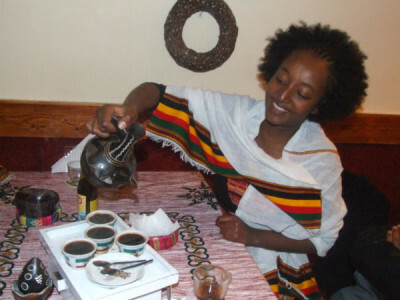 Ethiopian coffee is served with incense made of sandalwood. When pouring out the coffee, the coffee pot is held about ten inches above the cup. This creates bubbles in the cup of coffee so the taste and smell come out well.